EventHi- Cannabis Banking-What are my Options? Cannabis Banking-What are my Options? Being a few months into the new cannabis market in California, staying compliant and managing your finances are two of the more commonly heard challenges among operators. As an operator or ancillary provider in the cannabis industry, the challenges of banking are very well-known. For the compliant operators, banking should not be such a challenge but unfortunately, that is not the case. But there is light at the end of the tunnel. 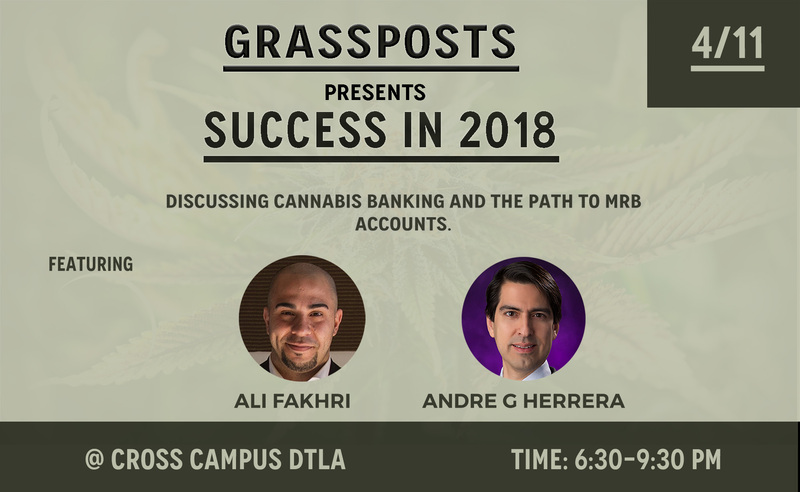 Make sure to attend our panel where you will leave knowing the steps you should be taking now in order to qualify for a Marijuana Related Business (MRB) account, importance of compliance when it comes to banking, some of the current solutions available. If you are interested in being a vendor at our event, please send an email to johnny@grassposts.com. Andre G. Herrera is Executive Vice President of Banking & Compliance at Hypur, Inc., where he leads Hypur’s collaboration with financial institutions on compliance and regulatory issues. Previously, he served as Senior Vice President and CIO of a bank in California, where he was responsible for the implementation and administration of all banking technologies and proprietary systems necessary to run the financial institution. Andre’s broad experience in payment system and banking technology management spans over 26 years and includes the management of complex, large-scale conversions, migrations and new product implementations. He has expertise in implementing merchant credit card processing programs and ACH, debit, credit and stored value initiatives. Considered an expert in banking challenging industries, he is frequently asked to speak at banking conferences and seminars providing insight and expertise. Lance Ott, Strategic Advisor for SIVA Enterprises, CEO of Guardian Data Systems, and former Director of National Bank of California, is an 18-year veteran of the cannabis, banking and financial services industries. He has expertise in FinTech, Enterprise Resource Planning (ERP), merchant services, operations, compliance and consulting. Ott also is a Certified Payments Professional “CPP” through the Electronic Transactions Association. Ott founded Guardian Data Systems in 2008 with the specific intent of providing secure, reliable and transparent financial services for our cannabis community. He is a cancer survivor and fierce advocate of alternative medicine, including medicinal cannabis. Lance Ott firmly believes that safe access to medical cannabis must be provided as medicine for any patient in need. Since the inception of Guardian Data Systems, Mr. Ott has become a ubiquitous presence at cannabis industry conferences and events produced by the MMJ Business Daily, National Cannabis Industry Association, International Cannabis Association/Cannabis World Conference, Israel Cannabis/CannaTech, Native Nations Events and Secure Cash Transport Association. He has been regularly featured in national media and his profile is highlighted in the third edition of ArcView’s Annual State of Legal Marijuana Markets Report. Last year, Mr. Ott was ranked #38 in the top 100 most influential cannabis business executives by Cannabis Business Executive. Lance Ott has demonstrated the courage of his convictions by fashioning a network infrastructure of cannabis friendly banks, institutions, processors and technology providers in order to provide the cannabis industry with a safe, legitimate venue for all commerce related and logistical challenges they may encounter. He has taken it upon himself to offer preeminent expertise for a unique and complex business model. Ott believes that proper regulation coupled with technology will bring credibility, legitimacy and transparency to our emerging and evolving industry. Lance Ott is currently serving his third term on the Board of Directors for the National Cannabis Industry Association and has served as a member of the ethics subcommittee. Guardian Data Systems is a Sustaining Member of the NCIA. Ott also serves on the Regulatory Advisory Board for the Los Angeles Cannabis Task Force, as well as the West Hollywood Bank Working Group. Ali Fakhri is the CEO and Founder of EventHi. EventHi is an event management platform built for the cannabis culture. EventHi was one of the first companies in California to obtain a Marijuana Related Business (MRB) bank account with Partner Colorado Credit Union. Ali’s background consists of working for and with two of the largest Fortune 500 companies, leading sales and business development. Ali considers himself an entrepreneur at heart launching his first business at the age of 20 years old. After being introduced to the medical cannabis industry, he started attending events, months later he began sponsoring and coordinating events. 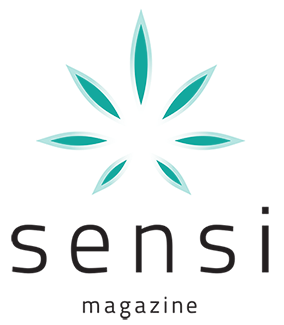 This experience allowed for him to see many issues that the cannabis events industry faced and after month’s of research, he began the development of EventHi to help bring a solution and fill a void for the cannabis industry. Ali is building an ecosystem through technology with a mission to bring people together offline.